When PCs are in a different subnet than a DHCP server installed, DHCP Relay Agent can be used to forward DHCP requests from PCs to DHCP server. How to configure DHCP Relay Agent using Huawei CLI? We want our PC to acquire its IP address from the DHCP server configured on the labnarioR1 router. To do so, labnarioR2 should be configured as a DHCP Relay Agent to forward DHCP Requests and Offers between server and clients. First, DHCP server should be configured. 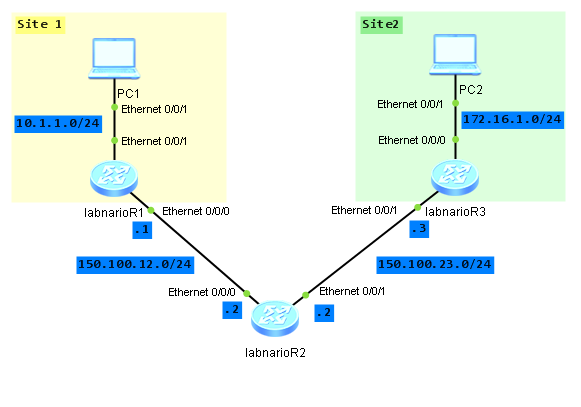 LabnarioR1 router will be configured to offer DHCP service for PC.